Joern, the person behind the pictures, takes pictures of the nature, who likes to take pictures of the diversity of the nature. Saturday the 12th of september, 2009 Joern took 3 pictures of the sky, he did this because there were some nice sky-formations, and these has no relations to the UFO. After the pictures was on the computer (transferred from the camera), he examined the pictures he had taken the day in question, just as everybody else normally would do. On one of the 3 pictures, he discovers a unidentified object (UFO), that looks like "a rocket ", as Joern choose to call it. The pictures were takes on the 12th of september 2009, at 09.10 am. Nothing has been manipulated or changed from the original photos ! 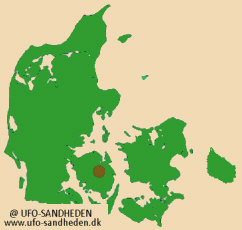 The pictures was taken to north western marking, and is shot in Sanderum near Odense. On the picture to the left we have enlarged the area where the interplanetary spacecraft could be seen on the sky. 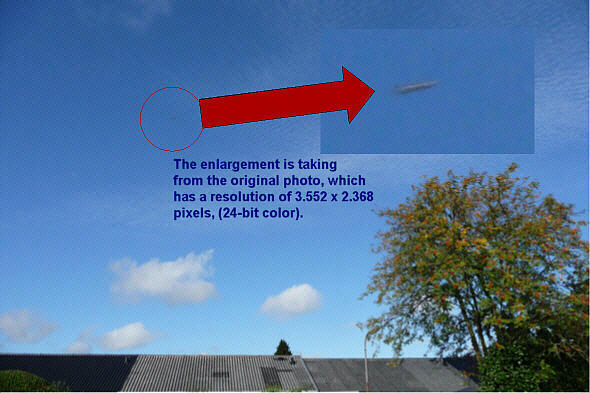 The enlargement that is pasted into the shown picture is taken from the original photo, which has a resolution of 3.552x2.368 pixels in 24-bit color.